The Catalog is a very powerful mouse-oriented interface. It can be toggled via menu Window | Show Catalog, and positioned via menu Window | Arrangement. By default, it is located right below the Tree. 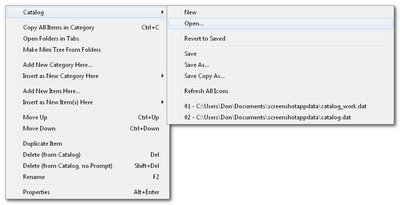 The Catalog has a large context menu (right-click the Catalog) where it can be configured. The Catalog is organized in user-defined sections called "Categories" which can be collapsed like tree nodes. You add new items, e.g. a folder, to a Category by dragging it onto the Category-Header. 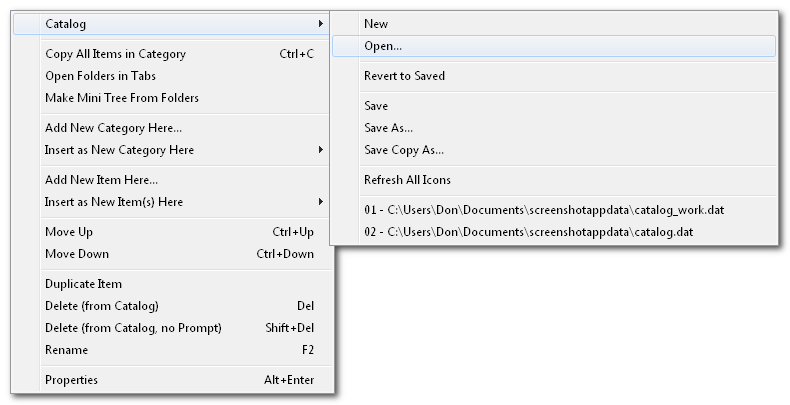 Clicking such a folder item will browse that folder in the current tab and pane. The Catalog can combine distributed locations and items (local, LAN, web) under one heading. By a single click you can go to, copy, open, or launch them. You can also drop items onto the Catalog to move or copy them to folders or add them to Zip archives. You can backup distributed items combined in a Catalog category in one go. Simply select a Category and use the normal Edit commands (Copy, Copy To..., Backup To...); they will be applied to all file system items inside that Category. 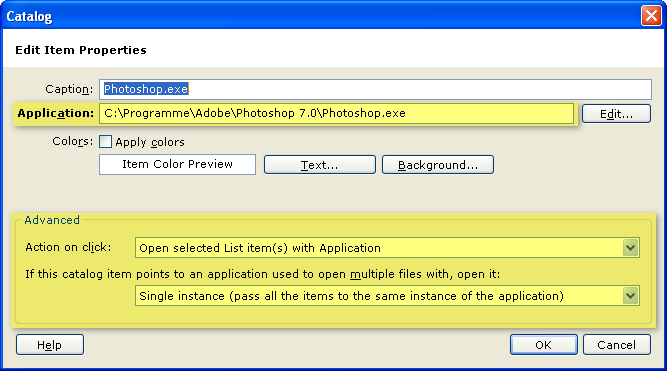 You can apply Visual Filters to the current file listing by a single click on a Catalog item defined as Visual Filter. Or you can start a one-click file search right from the Catalog. 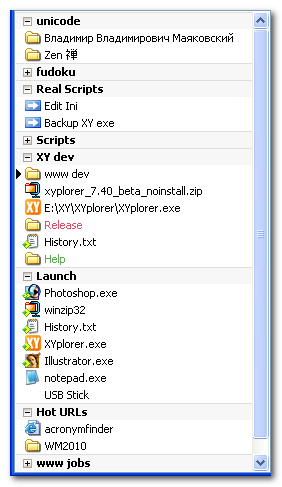 It can serve as a script library because you also can execute scripts directly from the Catalog. You move Catalog Items by dragging them to a new position, even to a new Category. The Catalog as well serves as Launch Panel for applications and data files. 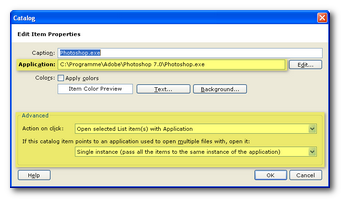 A single-click will open the application, or the file with its default application. Better still, simply drag'n'drop a file onto an application listed in the Catalog, and the file will be opened with that application. The Catalog can also work as an Open-With Panel. Add an application to the Catalog, the open its "Properties" via the item's context menu you can define the item to open all selected list items with this application (see image on the right). Of course, command line parameters can be defined in the Properties as well. The Catalog provides a flat hierarchy only one level deep. This "limitation" has a reason: It's relaxing because it limits chaos. Catalog management is straightforward: Add and move items by drag'n'drop, rename them by F2, color them for more visual grip. 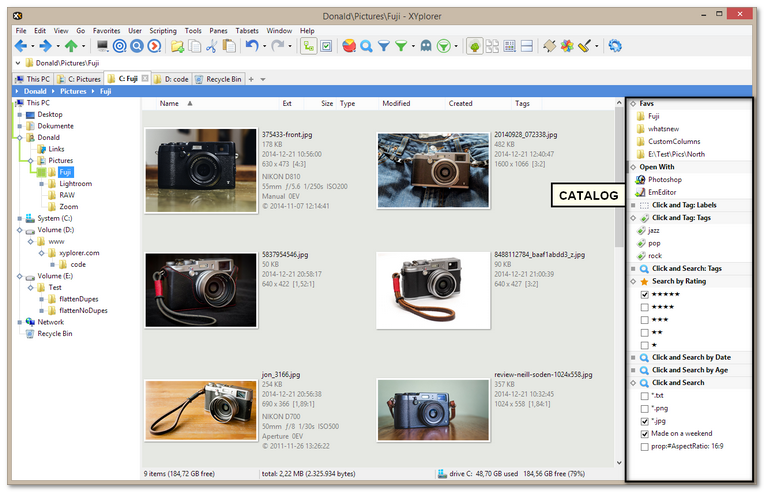 All catalog data are saved in a small file called catalog.dat and is ready for take-away. You even go so far and switch off the Tree completely by a quick Shift+F8. Now you browse via Catalog only. Recently Used Catalogs. At the bottom of the above submenu you find the most recently used Catalogs. 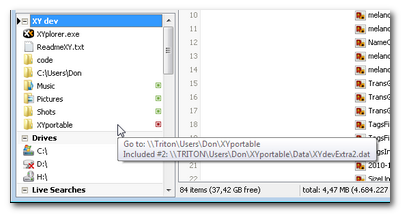 The most recently used Catalogs are also found in the context menu of the Catalog toolbar button. They can be managed via menu Tools | List Management | Recent Catalogs. Import/Export functionality. From version 9.90.0600 you find the commands "Import Catalog..." and "Export Category..." in the Catalog context menu under the submenu "Catalog". This feature allows you to easily move data between catalogs, and it provides a new elegant way of sharing extended functionality (scripts, filters ...) between users. See, however, Including Catalogs below for an even more elegant solution depending on your work flow. Version 9.90.0700 adds support for including multiple external catalogs. This is a corporate feature allowing teams to include multiple external sources for sharing items, and permitting management or leads to control who can modify these items. Items here include locations, drop targets, scripts, filters, searches, and programs. This page has been written 2009-06-14. The screenshots don’t reflect the current look of the application. Some of the functionality might have been changed or enhanced in the current version.